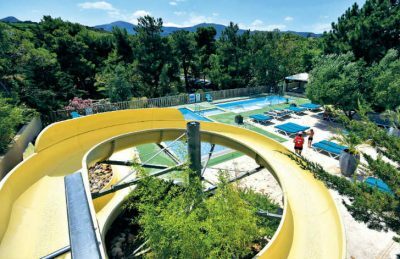 Les Criques de Porteils is a beautiful 5 star quality campsite that benefits from some truly wonderful views of the stunning Pyrenees and the Mediterranean sea. A member of Castels chain of campsites, Les Criques de Porteils offers visitors the chance to relax with breathtaking views from many of its pitches, a great range of activities and facilities and its own private pebble beach. If you’re looking for a small and quiet yet beautiful campsite in the south of France then Les Criques de Porteils could be for you. This small pleasant campsite is both beautifully maintained and landscaped to ensure that you have a really relaxing atmosphere and can sit back and truly enjoy your family holiday. The private pebble beach is perfect for swimming, snorkelling, fishing or just relaxing in the warmth of the summer sun and Mediterranean sea, whilst other activities available at Les Criques de Porteils will ensure that you’ll never get bored. A small yet perfectly designed swimming pool area awaits you back on-site once you’ve finished at the beach. Two swimming pools, water slides and some fantastic sun terracing ensure that you can relax or have fun in the sun depending upon how you’re feeling. Les Criques de Porteils campsite offers a comprehensive selection of activities and facilities on site and also nearby to ensure you have a fantastic family holiday. On-site activities at Les Criques de Porteils campsite include table tennis, tennis, football, basketball, outdoor gym, driving range, fishing, trampolines, boules, playground and cycle hire. Facilities available at Les Criques de Porteils campsite include WIFI, restaurant, takeaway, bar, groceries, animation team, washers and dryers. Accommodation at Les Criques de Porteils campsite includes a range of 2 and 3 bedroom mobile homes that are available from Eurocamp.